NetApp Rapid Clone Utility takes advantage of VMware vSphere 4's new storage plug-ins and copies, creates, and mounts new data stores without needing access to storage management tools. In this series of articles we will be looking at the new generation of VMware vSphere 4 plug-ins that make it increasingly easier to see your storage from the vCenter/vSphere client. In addition you will learn how the NetApp Rapid Cloning Utility is not just a virtual machine (VM) copying tool, but also allows you to quickly and easily create and mount new data stores without needing access to the storage management tools. This is must read series for VMware admins who maintain and manage their own storage, and for storage admins who want to offload the burden of provisioning new storage to their VMware guys. If you follow my RTFM blog frequently you will know I've been playing around with the new vStorage plug-ins for VMware vCenter for sometime. This week I was very fortunate to be granted access to NetApp's latest and greatest version of the Rapid Clone Utility (RCU) 3.0. It's currently in beta but will move into general availability (GA) very soon, and I'm very lucky to be able to give you a sneak preview. Of course, you do need to be a NetApp customer for the plug-in to work, but the beauty of the RCU is that it's totally free. And in my book, free is always good! The RCU is a neat little tool, albeit quite poorly named. It doesn't just clone virtual machines. It will help you with your day-to-day administrations. And if you're more of a NetApp administrator than a VMware admin, it's a way of giving your VMware people the ability to manage their own storage rather than bugging you all the time, safe in the knowledge that if anything goes wrong, it's their fault not yours! All kidding aside, if you couple the RCU with NetApp's Virtual Storage Console (VSC), you will be giving vCenter much more flexibility. Without any further ado, let's get this puppy installed and see what it can do for you. You can download the utilities from netapp.com. 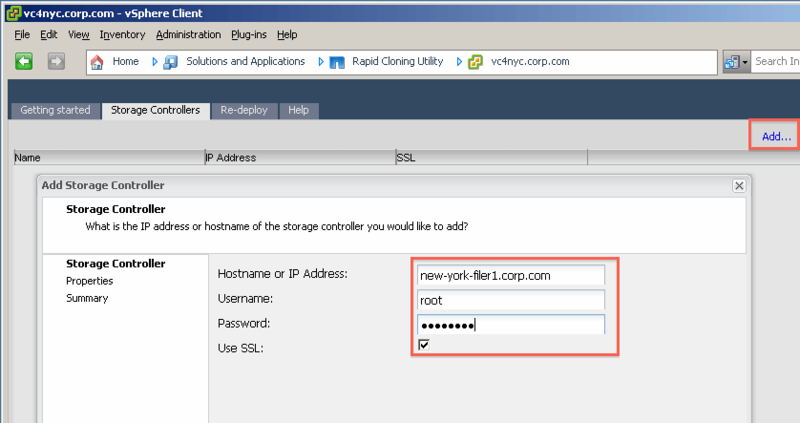 The NetApp RCU and VSC are both installed on your vCenter server and run as services on VMware's management platform. There's no client as such to install, which I like. 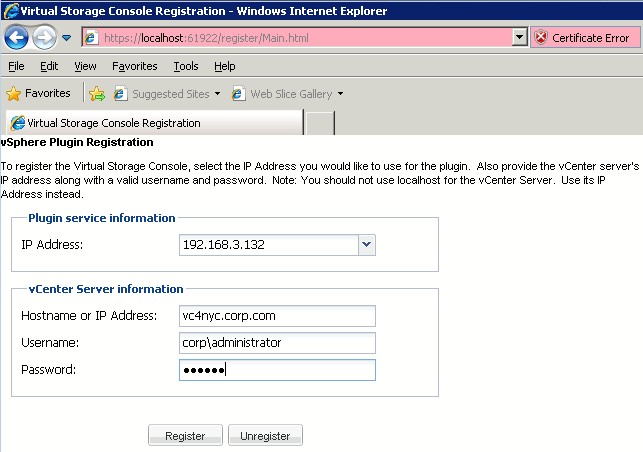 The user interface of the RCU is served up as a series of webpages embedded into vCenter. Normally, I'm a bit sceptical about this; after all, presenting a webpage in vCenter is no great shake, as the HP Insight Manager plug-in demonstrates. The difference with the RCU is that you get the feel of a real application inside vCenter. Installing RCU and VSC is a next-next installation routine. During the RCU installation the wizard asks you for the authentication details of the vCenter, so that the RCU can interact with vCenter from a plug-ins/extensions perspective. The VSC installer opens a webpage where you input the same information. It's not clear why the plug-ins have different front-ends. I suspect different teams within NetApp wrote them. It is possible to install the vStorage plug-ins on separate management servers if you wish, but I've found the RCU/VSC to be quite lightl and installing both of them on the same server didn't appear to affect the performance of the core vCenter services. After installing the two components its time to crank up the vSphere client. There will be two security prompts (if you have installed both the RCU and the VSC) to confirm you trust the clients connectivity to these new services. In the Plug-in Manager dialog box you should see two new extensions -- the Virtual Storage Console and "Kamino". 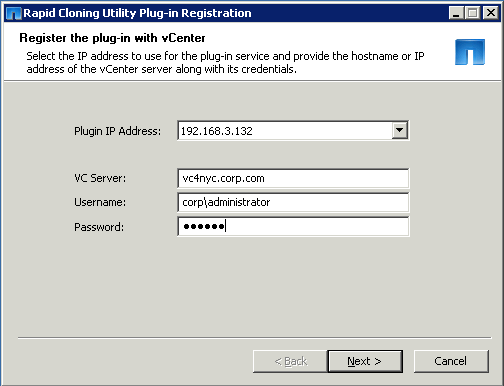 The VSC requires no post-configuration tasks for an admin to use it, but the RCU does require some. For RCU to work you are going to have to tell the RCU what the name/IP address of your filer is and how to authenticate it. To do this you need to crank up the RCU admin page. In the vSphere Client, navigate to Home \ Solutions and Applications Tab \ Rapid Clone Utility icon, and click the Storage Controllers tab. The Add… link over on the far right will allow you to kick things off. Start by typing either the name or IP address of the management interface of the filer, together with the username and password. In this case I'm being a very naughty boy by using root/password. You might want to create an aggregate(s) just for VMware, and then use permissions in the NetApp filer to restrict VMware folks just to their aggregate(s), effectively making a little sandpit where they can do stuff without fear of them affecting other subscribers to the storage array. At this stage the RCU interrogates the filer and reports on all network interfaces, existing volumes and aggregates. By default the RCU also adds in aggr0. I like to remove this from the list, as aggr0 is normally where the system that make the filer run is stored (called Data OnTap), and its not a good idea to create volumes there, even if there is free space. 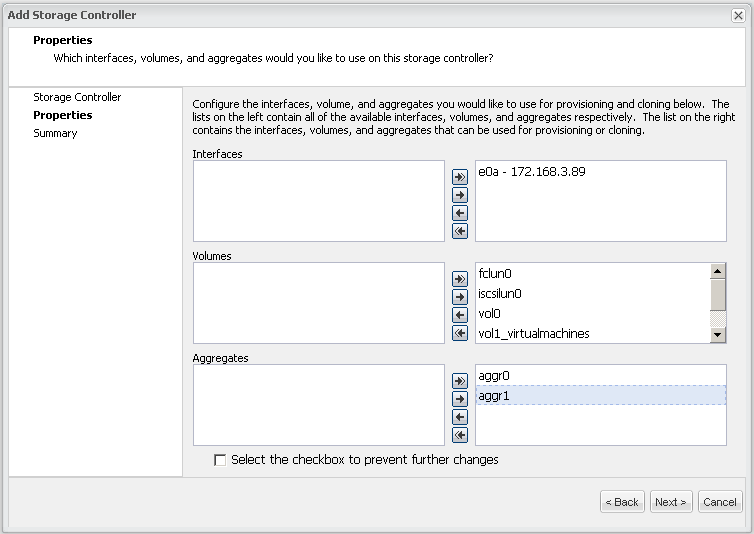 Use the arrows to add and remove interfaces, volumes and aggregates out of the configuration to restrict what the RCU can see and do.